I lay on the deck, pulling the back of my dress down, and pressed an eye between the slats. It was dark down there, but the Martins had strung party lights all over the porch so I could see lit stripes of him. “I know bear language.” He rolled over so we stared eyeball to eyeball. Grunt, sniffle, sniffle. Grunt. Grunt. I could smell the bear inside of him, berries, gobs of fat, bad breath. Sneakers was a runt. That’s what my dad called him. Sneakers the Runt. My dad fed him pills, a mixture of crushed animal bones, antler velvet, and bear bile that was supposed to make him grow. Instead, Sneakers was becoming a bear. He could see in the dark. He knew when people where nervous or afraid by their yellow glow. Once, I shined a flashlight in his eyes, and I saw red eyeshine, like an animal staring into a car’s headlights. Every year, the Martins held a gigantic company clambake. It was well into the night, now, and Sneakers and I were the only kids left. My dad was off playing horseshoes. My mother was asleep in our truck. “You better get out from under there,” I said and spit between the deck slats. I sat up and covered my knees with my dress. I heard Sneakers snuffle at the air, picking up the scent of Mrs. Martin’s peach cologne that wafted off her neck. “I can take it for her,” I said. The Martins always cooked gobs of chowder in a shiny aluminum trashcan over an open fire pit. Each year, my mother made a big deal about how grateful she was to Mrs. Martin for sending us home with it, but she was lying. She disliked her. She didn’t like the way she touched my father’s arm, letting her coral-lacquered fingernails linger when he made her laugh. “I didn’t do nothing,” he wailed, covering his ears. “It wasn’t his fault,” I said, but it didn’t come out loud enough for anyone to hear. “All right, then. You clean that mess up,” my father told Sneakers. “It was me,” I whispered, but again no sound came out. Sneakers nodded and stared at the ground. I nodded, too, but no one looked at me. “Good boy,” my dad said and walked off with his buddies. Sneakers unwound the rubber hose. “No,” he said. He turned the nozzle to full force and blasted the chowder off the deck until nothing was left but slimy globs that glowed under the party lights. But it did. I let him down. I always do. When we finally left, my dad walked with us, his hands resting on both Sneakers’ and my shoulders. Flaming-pink hydrangeas grew along the side of the Martins’ house. Behind us, his friends shouted “Later” or “Careful driving.” The leaves on the shrubs were black tipped and spotted, and the veins in the blossoms looked shriveled and blue. “Like you are with her?” my mother asked him. My dad turned the ignition. Our truck was old and didn’t have seatbelts in the back. Sneakers curled up on the seat and hid his face inside the crook of his arm. I cranked open the window. Sometimes, I was afraid when my dad drove after drinking. My parents always took us with them when they went out to parties or to their favorite bar, Michelangelo’s. We’d wait in the truck or just outside of it. We had books, playing cards, crayons, and paper. We had blankets if it got cold. They fought on the way home, which was always late, sometimes in the early morning. My father was too flirtatious. My mother was antisocial. She couldn’t handle her booze. They said things to each other like “you prick” or “you drunk” as if they’d forgotten we were in the back seat. Eventually, it felt like we weren’t. I pretended I was riding outside the truck, standing in the back bed, looking over the cab. It was quiet out there. The air was salty. The stars were bright. Moths jigged back and forth in the lit cone from the headlights. My body felt like a giant receptor, and the scent of everything, asphalt, pine, skunk, blew right through me. “What is it, Pumpkin?” He looked over his shoulder at me. The impact was so silent, I wasn’t sure my dad noticed. His face was so calm. And then I was tumbling. I had crayons in my mouth. Crumpled drawing paper wedged against my ears. My forehead oozed a sticky sweetness, and abruptly, without any memory of how I got from the truck to there, I was lying in a field. I heard movement, the shifting of grass. A tree branch snapped. “Daddy?” Three does and a stag stared down at me, their eyes, brown, soft, inquisitive. Then, they startled and fled. I was cold. My shoulders and forehead were wet. Something slimy, bloody, clung to my feet. I rubbed it off with a fistful of grass. Although my legs were wobbly, I was able to unfold them from the weird angle that I’d landed. I took a step. Nothing hurt. The pickup truck was tipped on its side. The smashed hood had sprung open, and the passenger-side door had popped. Steam hissed into the sky. I was afraid to step closer. A ground fog was moving through the meadow. I saw no color except the eyeshine of the deer watching from the edge of the clearing. I stepped closer to the truck. It was coated in a fungal green. And it was bone cold and silent even though I could clearly see the spitting of fluids boiling out from bent metal and split hoses. I climbed onto the back bed and looked into the cab from the rear window. The driver’s side was now on the bottom. My father, his head, crooked, his ear, bleeding, was all wadded up like he was frozen in a somersault. My mother, who’d been wearing her seatbelt, seemed only to sleep. Sneakers was not inside. “They’re not dead,” he said, from somewhere behind me. Again, I couldn’t find him. “Where?” This was a game we played outside Michelangelo’s. Sneakers would hide from me in the parking lot. Sometimes I couldn’t find him, and I’d get this crushing feeling as I searched for him, the only light, neon signs. And when I’d find him, tucked behind a wheel or fender, I’d pinch him really hard so he’d realize how mad he made me. “I’m over here, silly,” he said. Sneakers stepped from behind the car our pickup truck hit. The car had been thrown into the air and landed upside down. The roof was crushed. The car radio continued to play a bluesy ballad as if the people inside were not dead at all but only smooching, listening to a favorite song. I did not know if what then took place was some kind of hallucination or if I was only asleep in the meadow, dreaming. Sneakers was still the runt boy I had always known. He was wearing his striped brown shirt, his baggy jeans. But all around him, like a musky aura, a black bear stood. The bear was at least six feet tall, inquisitive. His round ears tipped forward. His eyes were phosphorus green. I understood at that moment that I had fallen into a between state. The couple who died in the crash were now standing outside the wrecked car, unharmed. She was small and slender. Her hair, once fastened with a shiny metal clip, had sprung loose. He wore tight jeans, cowboy boots. They danced to their favorite song. There were other creatures in the road. A fawn that had been struck by a car rose from the ditch and ambled past, bleating for its mother. Luna moths unfolded their lime-green wings and took flight. Sneakers the Boy was growing dimmer. The bear, which he was becoming, was now walking on all fours. He approached the truck where my parents were still trapped inside. He rubbed his shoulder against the upside-down side mirror. He sniffed the metal. He stuck his snout through the smashed windshield. The bear turned toward me. For a moment there was a flickering of images between Sneakers the Boy and the black bear. The boy was crying. I could now see the ugly gash where a shard of metal had struck his skull. The bear, swaggering in a wide-legged stance, roared, and then gently placed its front paws on the road and waddled over. I touched its fur, harsh, musky. It rubbed its shoulder against me. It sprinkled urine at my feet. Sneakers the Boy was silent. Sneakers the Bear made a cooing sound. I wanted to reach out and hug him, but I was afraid that if I did, I would disappear. I would never see my mother and father again. Sneaker turned toward the woods. As he walked, he marked his path with urine. He slid the soles of his feet through the grass. He wanted me to follow. 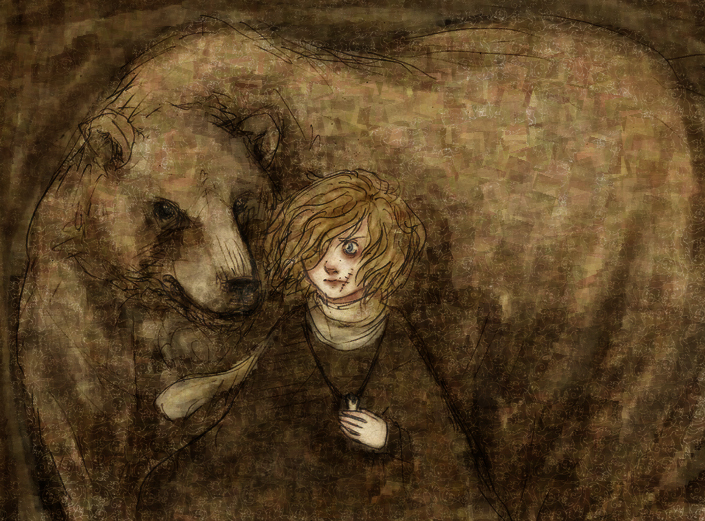 “I’m sorry,” I said, but of course, the bear couldn’t understand. At the edge of the woods, he rubbed the back of his neck against an old Cypress tree. He bit into it, shredding the bark. Then he ambled into the forest, without me. I drifted into an uneasy sleep and woke at dawn. I was back in the dewy meadow, surrounded by deer. They heard a noise, lifted their long necks, and fled, their hooves churning the meadow into the scent of green. I felt my dad’s arms around me, lifting me. “Pumpkin,” he said. “No, no,” he said. “It’s not your fault.” But it was. I’d lost Sneakers. I’d let him down. There were nights, years later, especially when my parents were fighting, and I could hear my dad smacking my mother around, that I’d believe Sneakers the Bear was just outside my bedroom, grunting and snuffling and waiting for me. I’d open the window and scream, “I’m here,” but he never answered. Charlene Logan Burnett earned her M.F.A. in Playwriting from the University of California, Davis. Her work has appeared in A cappella Zoo, Menacing Hedge, RHINO, Weave Magazine, and other journals. 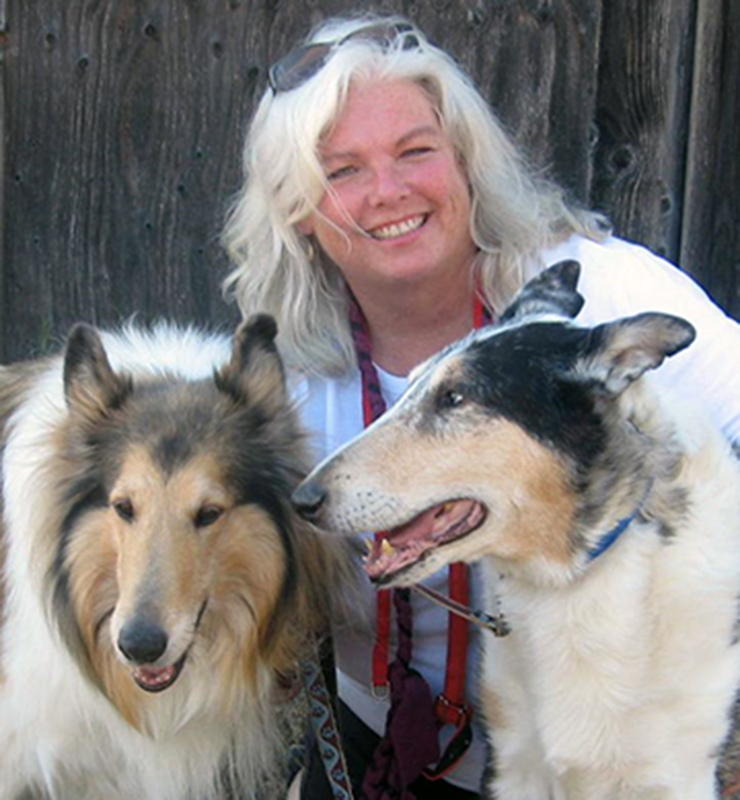 She is an animal advocate and service professional member of HeARTs Speak, a global network of artists who help raise awareness of homeless animals. She lives in Northern California. I love the nimble use of onomatopoeias, and its a great story to boot!